I am often asked about the origins of shamanism – when did it originate, where did it start, and who were the first shamans. 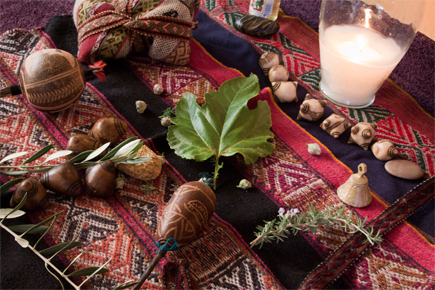 We know that shamanism is a prehistoric tradition dating back to hunter/gatherer (Paleolithic) cultures. Cave art 30,000-years-old shows evidence of shamanic practices, while rattles and other objects used in shamanic rituals have been found in material remains from the Iron Age. The word “shamanism” derives from the Manchu-Tungus (Northern Asia) word šaman, meaning one who knows. Shamanism has been termed “humanity’s oldest and universal expression of religiosity,” and its cross-cultural presence among hunter/gatherer societies suggest a connection to the evolution of the brain. In fact, we can safely state that all modern world religions have their origins in long-forgotten shamanic practices. Scholars have documented shamanism throughout Asia, Tibet, Oceania, Hungary, Sweden, North and South America, central Europe and Africa. Shamanic practices have varied extensively around the globe, but the role of the shaman as a healer and spiritual guide is widely shared. They were the first healers, teachers, and scholars. The Andean shamans of Peru, with whom I trained for several decades, trace their spiritual origins back to the early peoples that settled at the foothills of the Himalayas nearly 50,000 years ago. Migrants from the Indus Valley in the northwestern regions of South Asia, (modern-day Pakistan) were among the first medicine men and women to cross the Bering Strait from Siberia after the last glacial period, and were known as the Laika – the Earthkeepers of old. These shamans had direct experience of the energetic nature of reality. They understood that the material world is an expression of a subtler energetic realm that we interact with at all times. They learned how to dream their world into being within this realm, so they could participate in the creation and stewardship of the world, what we call reality. They revered all manifestations of nature. Today, there are few traditional shamans left. With the encroachment of civilization, the younger generation is more interested in exploring the exciting new options available to them. But spirit works in mysterious ways, and as traditional shamanic cultures dwindle, increasing numbers of world-weary refugees of modern society are finding a path to modern shamanism. We are the new shamans – the new caretakers of the earth, dreaming a more peaceful world into being. Even if we are not shaking feathers and rattles, or reading the oracle of the bones, we are shamans nonetheless, engaging with the luminous nature of reality, helping to heal the sick, learning how to prevent illness, and assisting the dying in their journey back to the world of Spirit. We are helping to birth a world of the possible, in which the rivers are clean, the air is breathable again, and where we are able to assist people who are suffering. We help our fellow humans understand that there is a way of living in stewardship and connection with nature; that when we step into that path which is the medicine way, we live in harmony and health. Is a person of knowledge and power. Uses power and knowledge in service. Knows that love is the organizing principle of the universe. Knows that creation is not complete – we help dream the world into being. Is one who has not left the Garden, is not separate from nature. Knows everything is infused with spirit, with life. Click here to read “The Shaman is…” in its entirety and to download the printable version.